It’s definitely apple season, I see them everywhere! And I feel kinda weird for not loving apples too much. But I do love pears more than words can say so might give these a try replacing apples with pears which are more delicate. Oh boy, I am excited about this! Made these for dinner tonight with some apples we picked at the orchard over the weekend and they were amazing! They really don’t take much longer than regular pancakes and the flavor burst from the apples is incredible. You don’t even really need syrup (although I did use some :)). My kids loved them too! I want to try all your recipes! Starting today, with this one 🙂 they were delicious pancakes; even the resident three year old and anti-whole wheat flour husband approved! That’s so awesome! I’m so happy to hear that. Thanks so much Katie! I like you, and your sister. Yup. I came here in search of an apple pancake recipe. I think I’ll stay a while. I made these and I thought there was a bit much salt in them, and I like salt to temper all “sweet” things. These tasted wonderful, but the batter was SO THICK. I had to spread it around with a spoon to get it to cover the apples. I’m not a novice in the kitchen and I’m not new to whole wheat flour. I got about six pancakes from this recipe. The pancakes took a while to cook, so I turned down the heat on the griddle, as they were getting too brown before the batter had a chance to cook all the way through. Gonna give these another shot with more milk…what do you think? (sorry if you already addressed this…I tried looking through the other comments first, but there are just so many. Hi Marilyn! The batter was pretty thick. I poured it and had to spread it as well, like you said. I often will add milk or water to my pancake batter if I want it to pour more evenly, but it will make the pancakes a little thinner in the end. I made these this morning and my family simply devoured them. This is a keeper!! Also I just love your pictures!!! That’s awesome! I’m so happy to hear that. Thanks so much Malinda! 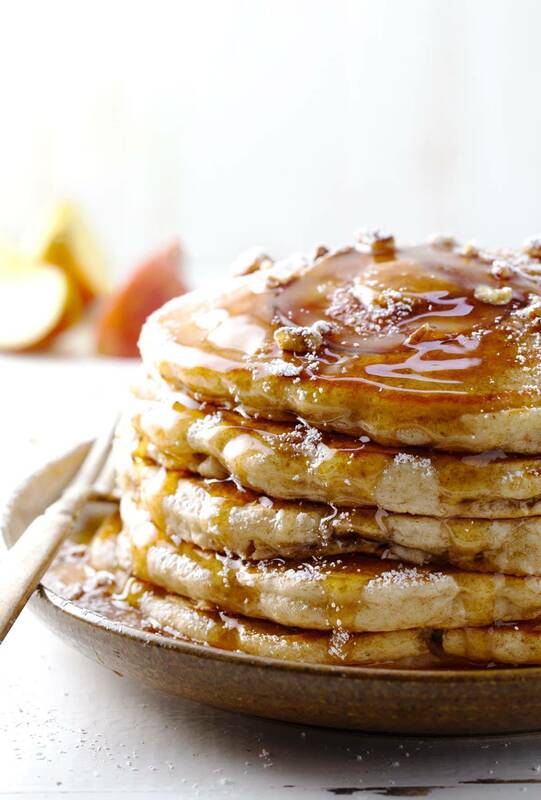 The pics of the pancakes are just beautiful! How do you take such amazing shoots?? Just stuffed my face with these using my tried and true pancake from scratch recipe, but adding whole wheat as you did. So pretty, those little apple slices, like sunny side up pancakes! Made some of the smaller apple slices into one slice silver dollarish cuteness. Thank you so much! Can never have too many pamcake variations in this kitchen….I think I’d peel the apples next time as mine had rather tough skins but still enjoyed! Amazing! Just made them, and they were a hit! Thanks for the recipe. Just made these this morning and we all loved them! Might be the best pancakes ever! Definitely will make again and again – thanks for a great recipe! Thanks Andrea! So glad to hear that! This apple pancakes are about to destroy my belly. No, seriously Lindsay! This is incredible! I’ve been in the process of transferring all of my bookmarked recipes and those saved in my inbox onto Pinterest and came across this recipe again – tried it this morning and beautiful! I’ve never made american style pancakes before, and in all honesty not the biggest fan (I’m English) but omg these are amazing! They even got my bf’s seal of approval and I have permission to make them again… Had mine with extra honey and cinnamon drizzled on top with greek yoghurt. Nom nom nom…. Love this terrific recipe. Thank you. Glad to hear that, Melissa! this recipe looks amazing! I wondered if you’ve made them ahead or frozen them to use several mornings? Thank you! These look amazing! Who doesn’t love pancakes, and this time of year I want to put apples in everything! Definitely need to try this ASAP! Hope you enjoy them Eden! I made these this morning! They turned out so delicious. Something to help in assistance for warming the soul. Thank you for the lovely recipe!!???? Can l omit the butter on this recipe maybe a little oil. Also can l use honey instead of the sugar. These look insanely delicious! Love the way the apple looks in them and I’m sure it tastes amazing!